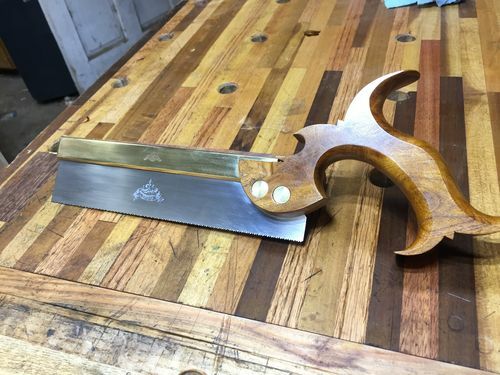 I needed a small high tooth count dovetail saw for thin stock and I wanted to build at least one saw in my life. So here I am. Passing it down to my son is a plus. 8”, 18ppi, .015 plate, filed rip, 1-3/4” ish under spine. 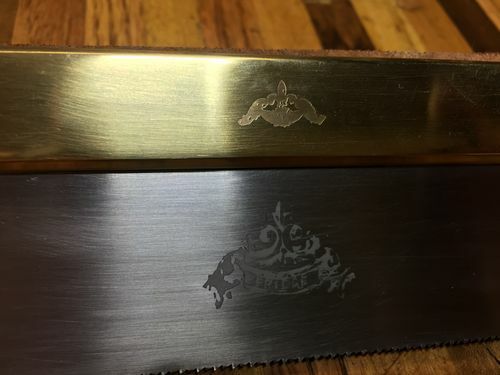 Did the etching myself. 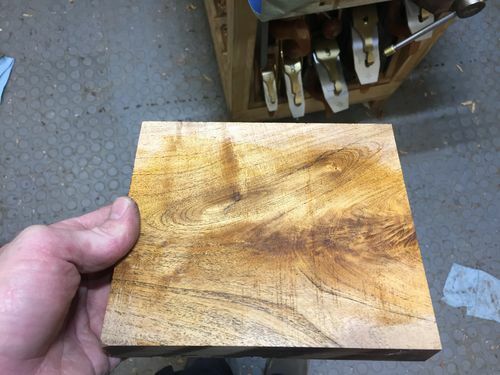 The handle blank is from AZwoody. He has a lot of nice stuff. Thanks bud. 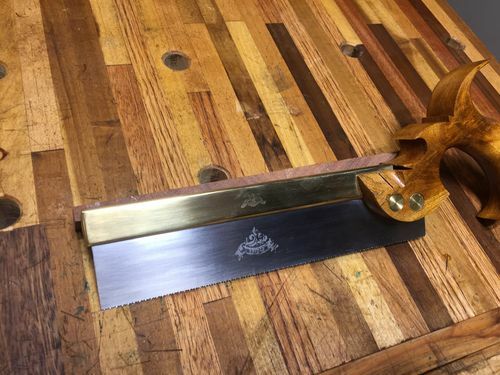 Back and sawnuts from Blackburn Tools. Used his templates as well. Love em. Got enough parts for 2 more saws. Mesquite. Wonderful stuff to work with. 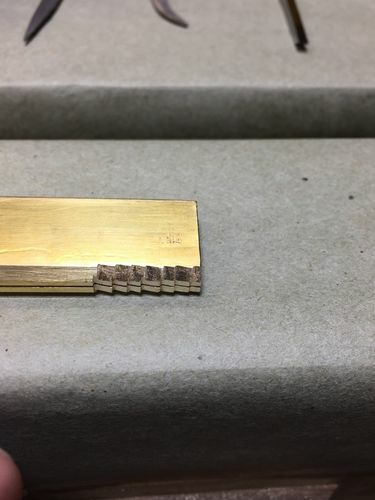 Use a corradi gold #6 & #10 rasp to shape. Used abranet variety pack up to 600g smooth. Worth every penny it is. Finish is garnet shellac brushed on and paste wax on that. It was surprisingly easy to shape. 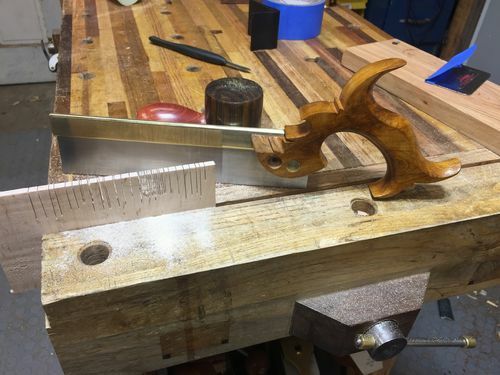 I just did small layers while holding the rasp at the same angle from the beginning of the curve to the end and just worked my way around until I was happy. I don’t think I’d try to make the full curve in one spot and moving on. A little a time at the same angle all the way around worked for me. I wanted a friction fit so I used vise grips to pinch it close every 1/4 so a .010 shim would fit easily but a .015 shim would not. I used a simple jig to file 45 bevels on all sides pretty much the same depth and just kept breaking down the top bevels til it was round. 400g & 600g paper, 4/O steel wool to brighten it. Strop to polish it. I cut and peined the end. The rounded it with a file and paper and steel wool and then polished it. I struggle letting the saw into the mortise so I tried a bright idea. File teeth in an unused part of the back. I cut out most of the waste and finished using the teeth on the back. Worked like a grade A champ. Perfect. Used .015 plate with 18ppi teeth. Must have filed the teeth almost all the way down about 5x before picking up a glardon vallorbe cut 2, 3 square needle file. The difference between it (left) and an older but still new grobet double xtra slim Taper file (right). Stocked up on vallorbe files after that. Gonna try a Nicholson which was recommended and easy to get. 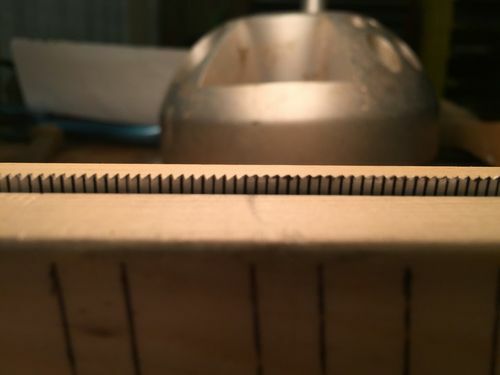 My confidence in my sharpening ability has increased dramatically. Nothing like practice is definitely the case. Training my eyes was the hardest part. 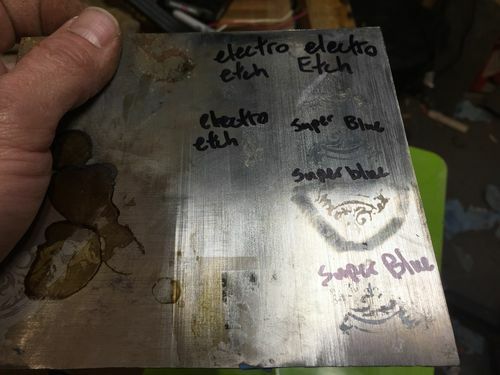 Might try a buddy’s laser next time but I didn’t have time to work that out so I tried electrolytic witching with salt water. 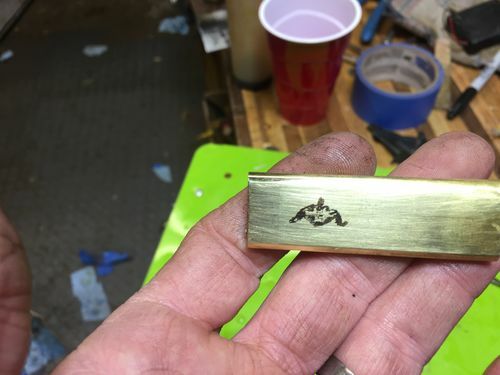 Works great on steel but just ok on brass. Pretty sure I wasn’t using the right solution for brass. This blog from Bobasaurus helped a bunch And I figured out what not to do through trial and error. Thanks bob. A couple things to go over and add. Has to be printed on glossy paper. Tried regular and bright paper with poor results. Has to be printed with toner and not ink. Toner is plastic. Ink is ink and won’t work. Area must be clean clean and avoid touching the pics as much as possible. When you soak the paper and you try to pull the paper off before it’s ready you might ruin it. Hell. You might ruin it trying your hardest not to. Tape it down well. And let it soak. A cheap amazon sealing iron, as I used, worked well. Heat it up for a couple minutes then apply pressure. Once it sticks it needs to be burnished well. Especially areas with fine detail. I found you couldn’t really couldn’t put enough heat or pressure. The longer I worked on it the better it worked for me. Use shellac everywhere you don’t want etched, even up to the open areas. Worked great. Pretty sure tape would work as well. I just preferred shellac. I used a 4-AA battery pack to start it and a 20V lithium tool battery to finish it. Just about any dc low voltage will work. I’ve heard of people using power wheels battery chargers. I preferred starting will the AAs to get even coverage and finish it off with the 20V. I found q-tips worked the best for small stuff. Edit: I used Inkscape to make a useable image. It takes some learning. Any clear areas must be clear. No shadows. Strictly black and white. I also tried using super blue. Easy with a Great dark color but the slightest finger print while prepping can mess it up. It warrants more piddling with. 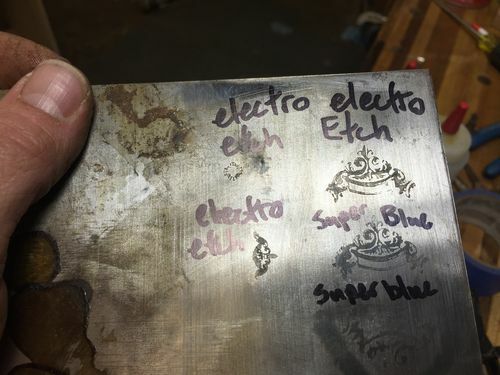 Once I discovered that slightly preheating the image and brass will drive the moisture out and prevent condensation from forming between the image and surface to be etched. I had a problem because my shop was cold and humid. After I figured out what was going on I had much greater success in later tests. And patience. Do. Not. Rush. I tuned it before everything was complete. It’s hard to see but a can make a cut and leave a sliver. It still needs to have a hair taken out the set. It cut awesome and straight with little effort but it steers a little to easy. All in all. I am happy happy happy. I’d be glad to answer any questions you may have. I’m not the most knowledgeable but I learned a crapload and plan on using it to build 2 more for friend really soon. It’s a beaut!! Great post. Strong saw game Fridge. Very strong. Looks great Fridge! That large brass spine must make it feel good in the hand. The tote looks great too. Nice work! Oh yeah, that is nice! Amazingly well done. A treat to read about your process. The outcome is just fantastic. Nicely done Fridge. Can’t wait to see the next ones. Good looking saw, Fridge. Mesquite though … hummm … why not alder? LOL! Great job and nice write up, Fridge! The mesquite handle looks very comfy. Much appreciated fellers. Learned a bunch. Good times! Wow Fridge that is an amazing saw! Quite surprised you didn’t use alder for the handle.